When Italian cinema deals with political issues, it always seems much more interesting to me than in, say, a French film. French cinema always seems much more didactic when it deals with these issues. The most egregious case might be Godard's La Chinoise which basically consists of a bunch of '68 fiery youths discussing Maoism. Even so, more contemporary French cinema always seems like it's driving home a point, even in the guise of a narrative. I find Italian films more interesting than French ones when they deal with political issues. What you get, usually, are Machiavellian dealings and a dramatic arc. Woven into that, you also get commentary on the state of government corruption, social issues and the nature of ideology. Salvatore Guilano (1962) by Franscesco Rosi is not usually considered part of the neo-realist movement. It is not usually presented on a par with films by De Sica, Visconti, Antonioni and co. However, it employs all of the neo-realists' aesthetics - hand-held cameras, filming on location, grainy resolution, etc. - and is more interesting than a lot of those films. A director like Visconti always falls back to soppy melodrama. Rosi confronts political issues head-on. Presented in a non-linear style, the film is ingenious in the way it presents its material. The eponymous character never appears. Well, we do see him once or twice - as a corpse. The film comes back again and again to the moment where he was murdered by the Italian police. 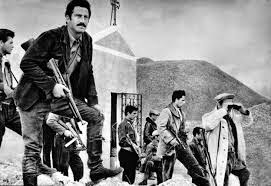 The film is shown from the perspectives of the insurgency fighting for Sicilian independence. The film aptly captures the kind of revolutionary ardour which characterises leftist Italian politics. It also amply demonstrates the inevitable fissiparity and in-fighting of these movements. The post-war call for Sicilian independence, however noble its founding intentions, swiftly degenerates into acts of collusion and betrayal. Bernardo Bertolluci's The Conformist (1971) is a fascinating political thriller. A conscript for Mussolini's secret police service is ordered to murder a Marxist professor, who once taught him during his years as an undergraduate student. Without a trace of compunction, he and his partner ingratiate themselves with the professor and his wife before the inevitable murder takes place. Stylistically, the editing of the film is fluid, employing a lot of jump-cuts. As such, it is enthralling to watch. 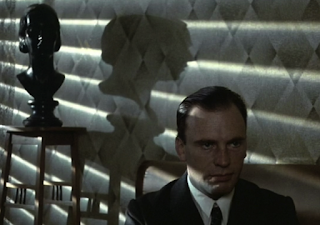 The lighting creates a lot of contrasts and plays into the film's overriding symbolism. As evidenced by the photograph below, there a lot of chiaroscuro. The films has scenes with copious use of colour as well as others which employ heavy saturation. Sorrentino has been accused of indulgence. He has also been accused of being all style no substance. His scenes are beautifully shot. He employs a lot of tracking shots as well as panoramic shots. The scenes of the house of parliament, as a result, are made to seem ornate, as if they were Catholic churches. This is made all the more ironic given that its main character is a dull politician. (Played in a wonderfully soporific and dead-pan way by Tony Servillo.) The title translates as 'the divine.' The character is the lead politician of the Christian Democrats. The framing of the shots, and the significance of the political party, make it abundantly clear that the film ironically plays with the lofty religious overtones This is despite dealing with dull, duplicitous and morally shady characters. The lead character becomes involved with the Mafia and orders the killings of political opponents to advance his political career. As he becomes embroiled in a court case which will lead to his incarceration, he faces it with equanimity and never displays a guilty conscience. It is clear that the film was made during Berlusconi's reign. This is not only does it deal with the court case of a politician. Politics is made out to be a frivolous game and as nothing more than an ecstatic party. Although addressing a figure from the seventies, Sorrentino is clearly commenting on the present day. This is a riveting film which clearly shows why Sorrentino is one of the best directors working today.